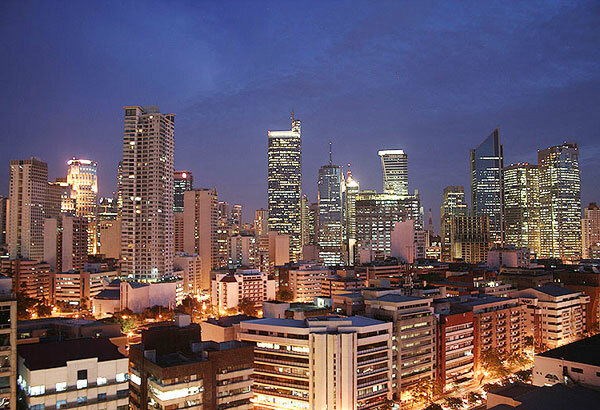 MANILA, Philippines — Cebu, Quezon City and Cainta, Rizal retained their position as the wealthiest province, city and town, respectively, the Commission on Audit's 2016 Annual Financial Report on local government units showed. Published on the COA's website on October 12, the audit body's financial report shows that Cebu, Quezon City and Rizal remain at the top spot in their respective categories for two consecutive years (2015 and 2016) owing to the significant increase in the assets year-on-year. Cebu widened the gap from the rest of country's provinces with total assets of P32.429 billion in 2016, up by P2.098 billion from P30.331 billion assets in 2015. Landing at a distant second was Rizal province with P11.73 billion assets in 2016, an increase of P2.184 billion from its P9.546 billion assets in 2015. Also posting double-digit assets was Negros Occidental, which came in third with P11.042 billion in 2016 from P9.397 billion the year before. From 6th spot in 2015, Batangas climbed two rungs higher after it posted P9.979 billion in assets last year, an increase of 5.7 percent or P3.571 billion from P6.408 billion assets the year before. Also up by two notches was Bulacan with P8.964 billion assets in 2016 compared to P6.38 billion in 2015 when it landed on the 7th spot. Palawan, meanwhile, landed at 6th place, a spot lower than in 2015 despite an increase in its assets to P8.199 billion in 2016 from P6.596 billion the year before. 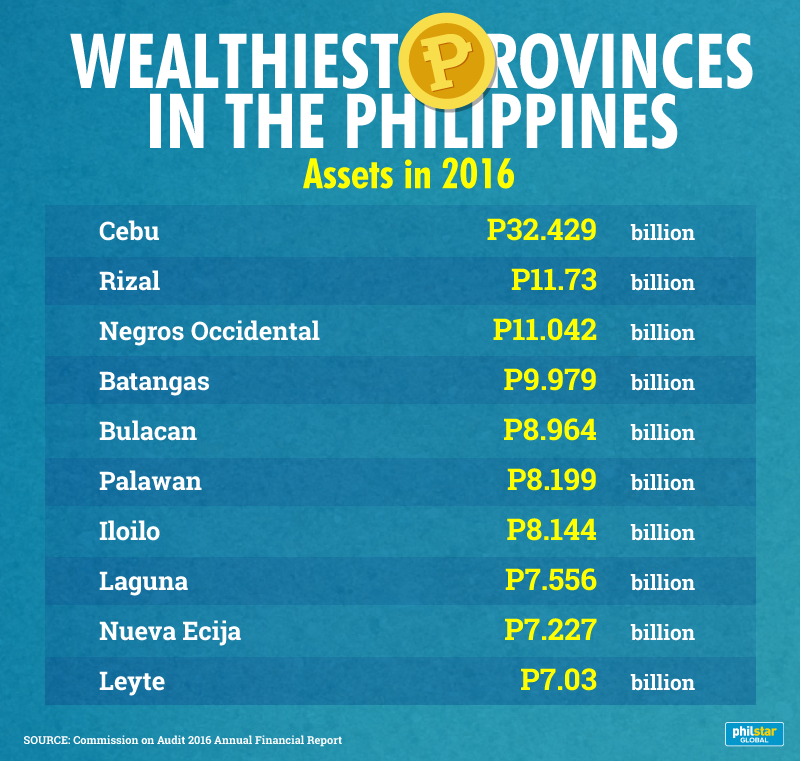 Newcomers on the top 10 wealthiest provinces list were Iloilo at 7th place with P8.144 billion assets and Nueva Ecija at 9th place with P7.227 billion assets displacing Cavite and Negros Oriental. Laguna landed at 8th place in 2016 from 4th place the year before despite a slight increase in its assets to P7.556 billion from P6.91 billion in 2015. Leyte remained at the 10th spot with P7.03 billion assets in 2016 from P6.06 billion in 2015. The first eight cities on COA's 2015 list retained their spots with Quezon City leading the pack with P59.556 billion assets in 2016 from P51.648 billion the year before. Makati remained at the second place with P54.85 billion assets from P49.494 billion in 2015, followed by Manila with P36.102 billion from P33.104 billion in 2015. At fourth place was Cebu City with P32.623 billion assets in 2016, a slight increase from P32.41 billion in 2015. It was followed by Pasig with P29.899 billion from P24.945 billion in 2015; Taguig with P16.268 billion from P14.291 billion in 2015; Pasay with P14.954 billion from P13.487 billion in 2015; and Caloocan with P14.702 billion from P12.943 billion in 2015. President Rodrigo Duterte's hometown, Davao City, was a newcomer on the list snatching the 9th spot from Iligan City which dropped to the 10th spot. Davao City posted P9.899 billion assets in 2016 from P7.19 billion in 2015 while Iligan posted P9.897 billion from P9.617 in 2015. 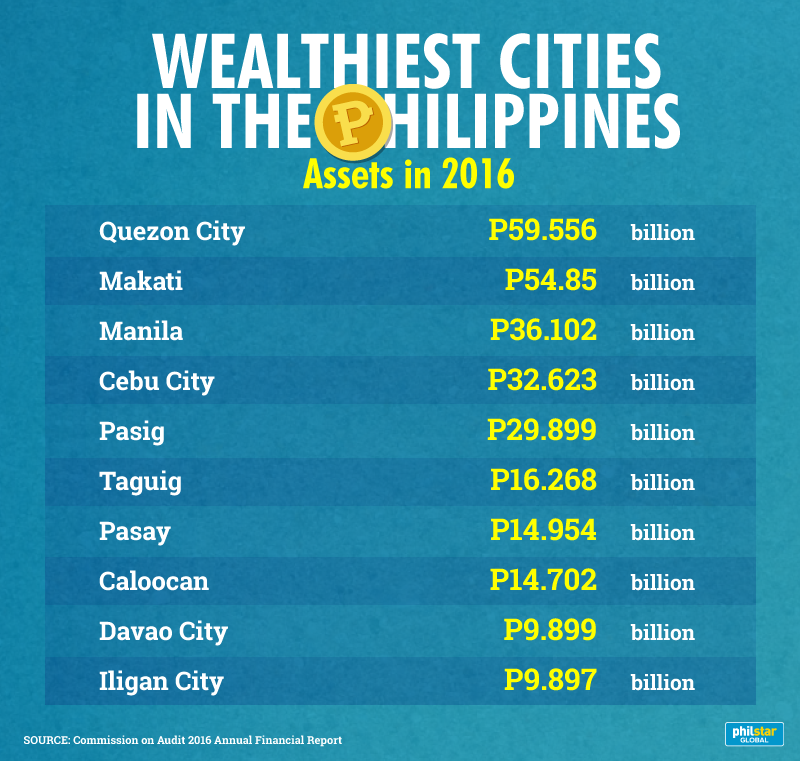 Cainta, Rizal remained to be the wealthiest municipality in the country with assets increasing to P3.511 billion from P3.176 billion in 2015. Limay, Bataan made the biggest leap from 5th place in 2015 to second place in 2016 with P2.54 billion assets up by P769 million from P1.771 billion assets the year before. Erstwhile second placer Mariveles, Bataan dropped one place with P2.103 billion assets from P2.165 billion in 2015. Sual, Pangasinan and Sto. Tomas, Batangas also dropped one place, landing at 4th and 5th spots, respectively, with P2.037 billion and P1.589 billion assets from P1.911 billion and P1.84 billion, respectively, in 2015. Tanay, Rizal, the 7th placer in 2015, snatched the sixth spot from Taytay, Rizal which dropped to 10th place. Tanay posted P1.514 billion assets from 1.284 billion in 2015 while Taytay's assets slightly increased to P1.373 billion from P1.301 billion in 2015. Newcomers on the Top 10 list were seventh placer Claver, Surigao de Norte with P1.426 billion assets and ninth placer Polomok, South Cotabato with P1.433 billion assets. Their entry came at the expense of the municipalities of General Trias and Silang both in the province of Cavite, the ninth and 10 placers, respectively, on the 2015 list.